It is not important whether or not the Fischer house Trick or Treated on Saturday. What is important is the way we behave ourselves as we live our convictions. There will always be differences among us. 18 For, in the first place, when you come together as a church, I hear that there are divisions among you. And I believe it in part, 19 for there must be factions among you in order that those who are genuine among you may be recognized. i have a precious friend who survived the genocide in Rwanda, having been born and raised in Africa her experience with the symbolism and rituals seen in our Halloween is that which is strongly rooted in the demonic world of witchcraft and satanism. My friend was absolutely shocked and heart broken that a Jesus Follower in the united states would every for any reason take part in halloween. i cared for three most amazing little boys for 11 years. Their mama and daddy worked outside of the home and each morning from the time their mama returned to work post maternity leave, those three boys were brought to our back door and we were trusted with their hearts. The family was from a traditional spiritual background and the concept of personal relationship with Jesus Christ was seen in a fresh way through our home as we interacted each day. 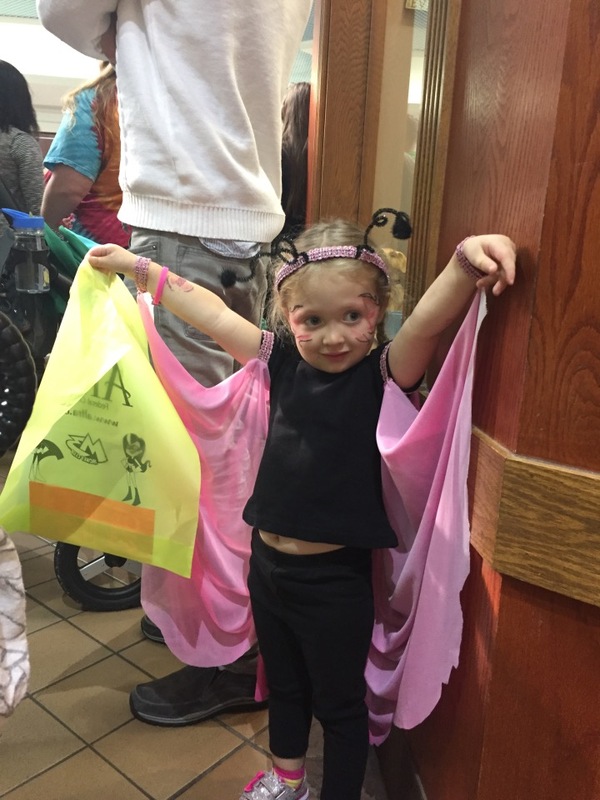 The parents had been raised by loving parents in safe little midwest neighborhoods where October 31st meant magical dress-up, friendly neighborhood fellowship and lots of candy all wrapped into a night of great adventure. There was absolutely no reason that this mama and dad would have every considered halloween was anything but safe fun. When we brought our Blessing home from Africa we were still mostly a “non trick or treating” family. One October day as our daycare mama was picking up her boys she asked if we would like to trick or treat with them. Tim and i processed and concluded “being” the love of Christ was much more important in this moment than speaking our personal concerns about the holiday. We dressed our Blessing in a hand me down bumble bee costume and enjoyed an hour of sweet fellowship as our kiddos collected treats from the neighbors. You can imagine how painful it was for my Rwandan friend to try to understand how we could expose our tiny African baby to those evils. We talked and we trusted one another but most importantly we trusted our God and we chose love. Upon coming together, they fell into divisions, schisms. Christians may separate from each other’s communion, yet be charitable one towards another; they may continue in the same communion, yet be uncharitable. This last is schism, rather than the former. Sometimes in the Family of Christ you will be called to “blue” and we may be called to “red.” If we will choose to live kindly with one another we may see that perhaps both are a part of a plan that is bigger than us. Perhaps there is a gorgeous display of His Love waiting to be revealed in rich lavender hues through the working together of differing convictions within one body. with my Rwandan friend. Her experiences are real and painful, her concerns are birthed from very deep spiritual wisdom. Being careful is Loving her well. I will never try to convince neighborhood friends that the very real dark practices of Africa and present day witchcraft in or community make Pumpkins and PowerRangers evil. That would not be loving them well. Black and White, cut and dried, rules and agreement is safe. My flesh likes safety and policy with a dash of legalism thrown in there for good measure. I really don’t need to rely on my Lord when i have the rules all drafted or when i find a little circle of Jesus lovers who agree with me and follow my same little set of “bests”. i need to need Jesus and perhaps that is part of why my Loving Lord has designed my walk to include differences with those i value deeply. Seek to know the one true God first and foremost. Desire to use every breath he gives me to share His Love with the world i have been placed in. Enjoy this moment of His Love and rejoice in the amazing beautiful adventure He has written for our family today and eternally. Rest in the Hope that is ours because of Him. Now to him who is able to keep you from stumbling and to present you blameless before the presence of his glory with great joy, 25 to the only God, our Savior, through Jesus Christ our Lord, be glory, majesty, dominion, and authority, before all time and now and forever. Amen. 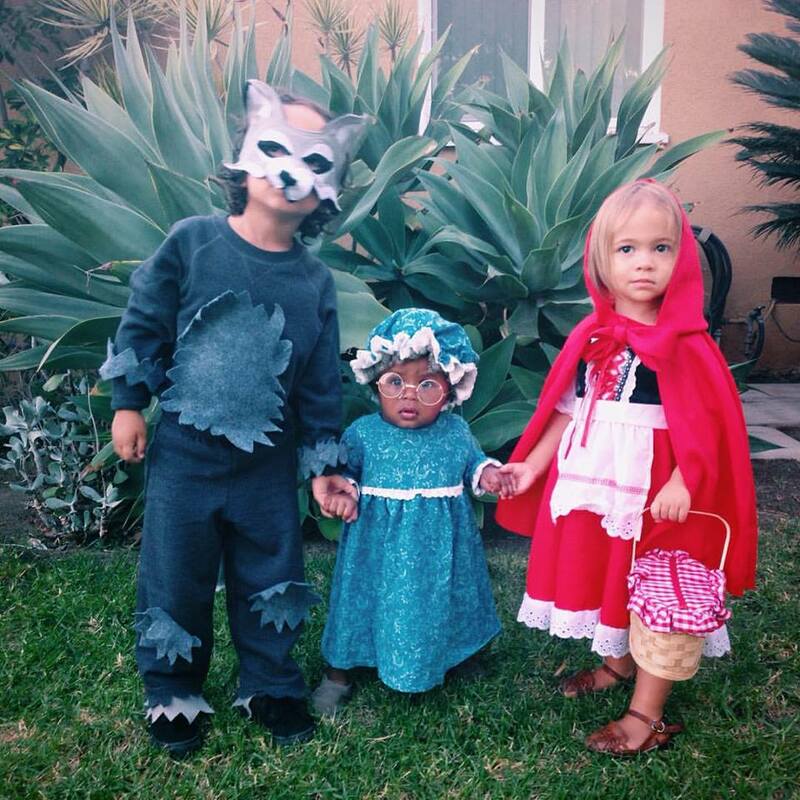 Our California Big Bad Wolf, Granny and Little Red Riding Hood. Kingston, Esme and Raena. We had a Sparkly Pink Butterfly with “my very own make-up” Finley Rose. 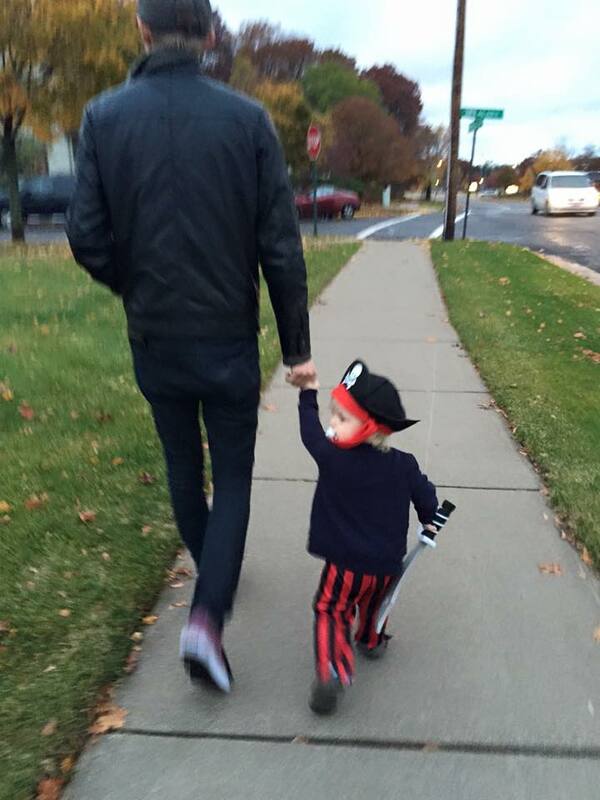 A tiny pirate searching for Booty Spotted with his daddy. Timothy . 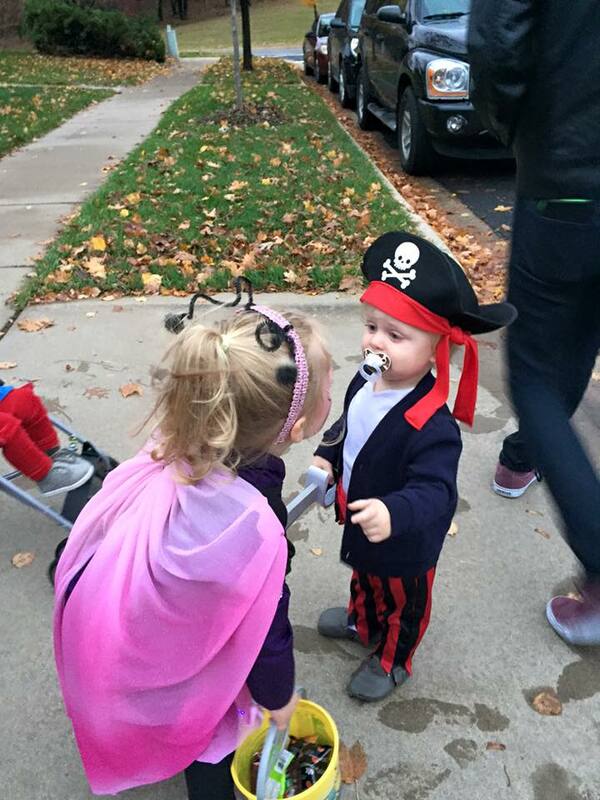 The Butterfly is always keeping an eye on the Pirate. 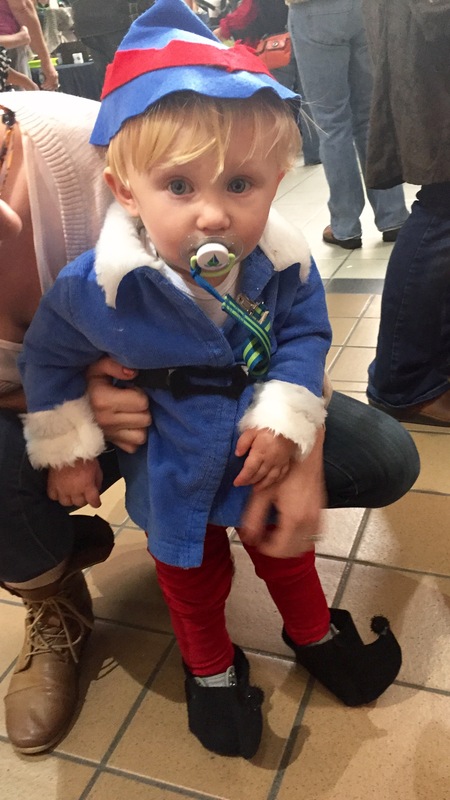 And then there is this guy….Hermey the dentist Elf from Rudolph the Red-Nosed Reindeer. Wyatt Beau AKA Boy. 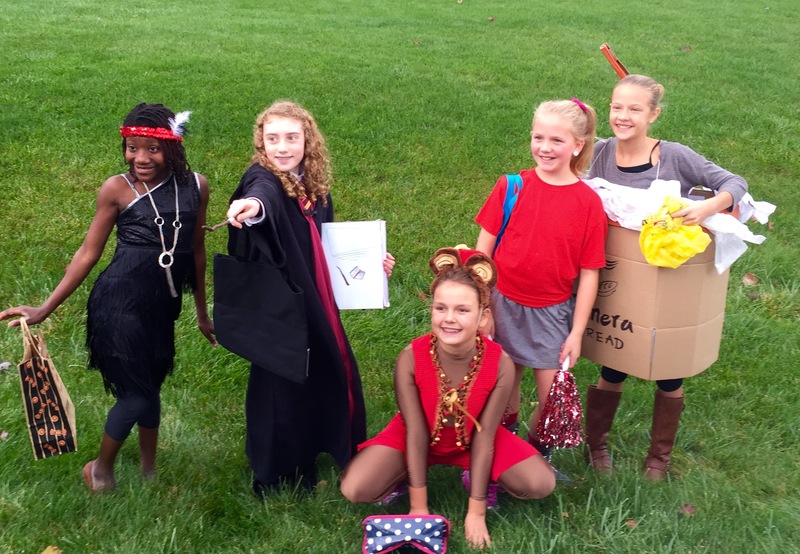 Blessing was a 20’s Flapper, she was hanging out with a Student, Monkey, Cheerleader and takeout Panera. The weather was perfect to be out and about for the evening, we met the new neighbors in the new home, visited with a couple moms i have never gotten to chat with and laughed a lot. My DIL’s invited me to help with the creation of Butterfly, Wolf, Granny and Hermey, oh how i love creating with my girls for their little ones.